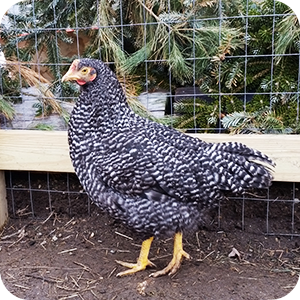 Barred Rocks, Easter Layers, Rhode Island Reds… OH MY! We love our egg laying hens, and boy are they spoiled! Their coop is located right off of our main hay barn, sheltered from wind and rain. They enjoy two different outside areas where they take dust baths, bathe in the sun and dig for gold, well... Insects! They are fed a high quality diet of pelleted laying feed, oyster shells, flax seed and scratch grains. They also enjoy their daily treats which include pumpkins, vegetables and other goodies. An egg takes 26 hours to fully develop, so each hen will lay about one egg a day. But they don’t lay year round. Every hen will go through a molting phase where they lose their feathers and regrow new ones. Molting takes a lot of energy so they do not lay during this period. At Hubbard's Farm, our hen house is filled with happy hens! Why are they so happy? They are free to roam. In return, they bless us with a good many eggs. You're sure to notice the tasty difference between our farm fresh eggs and supermarket eggs that are shipped from who knows where. Eggs are versatile. They can be hard boiled, scrambled, fried, poached, or used in baking and cooking. Stop by the farm to pick up a dozen today! Check out the Incredible Eggs website for everything you ever wanted to know about eggs, including lots of recipes. Orders and Inquiries, please call 978.464.2041 or Email Us.